ApproximativeJoin merges sorted data from two data sources on a common matching key. Afterwards, it distributes records to the output based on a user-specified Conformity limit. ApproximativeJoin receives data through two input ports, each of which may have a different metadata structure. A conformity is then computed for matched data records. The records with greater conformity are sent to the first output port. Those with lesser conformity are sent to the second output port. The third output port can optionally be used to capture unmatched master records. The fourth output port can optionally be used to capture unmatched slave records. The output port for joined data with greater conformity. Any, optionally including additional fields: _total_conformity_ and _keyName_conformity_. See Metadata. The output port for joined data with smaller conformity. ApproximativeJoin propagates metadata from the first input port to the third output port (from left to right) and from the second input port to the fourth output port (from left to right). Metadata on the first and second output ports can contain additional fields of numeric data type. Their names must be the following: "_total_conformity_" and some number of "_keyName_conformity_" fields. In the last field names, you must use the field names of the Join key attribute as the keyName in these additional field names. To these additional fields, the values of computed conformity (total or that for keyName) will be written. A key according to which the incoming data flows with the same value of Matching key are compared and distributed between the first and the second output port. Depending on the specified Conformity limit. See Join key. This key serves to match master and slave records. See Matching key. Transform  A transformation in CTL or Java defined in a graph for records with greater conformity. An external file defining a transformation in CTL or Java for records with greater conformity. Transform class  An external transformation class for records with greater conformity. Transform for suspicious  A transformation in CTL or Java defined in a graph for records with lesser conformity. An external file defining a transformation in CTL or Java for records with lesser conformity. Transform class for suspicious  An external transformation class for records with lesser conformity. Locale Locale to be used when internationalization is used. If set to true, upper and lower cases of characters are considered different. By default, they are processed as if they were equal to each other. The definition of an action that should be performed when the specified transformation returns some Error code. See Return Values of Transformations. The URL of a file to which error messages for specified Error actions should be written. If not set, they are written to Console. In previous versions of CloverDX, a slave part of Join key. Join key was defined as a sequence of individual expressions consisting of master field names each followed by parentheses containing the 6 parameters mentioned below. These individual expressions were separated by a semicolon. The Slave override key was a sequence of slave counterparts of the master Join key fields. Thus, in the case mentioned above, Slave override key would be fname;lname, whereas Join key would be first_name(3 0.8 true false false false);last_name(4 0.2 true false false false). Slave override matching key In previous versions of CloverDX, a slave part of Matching key. 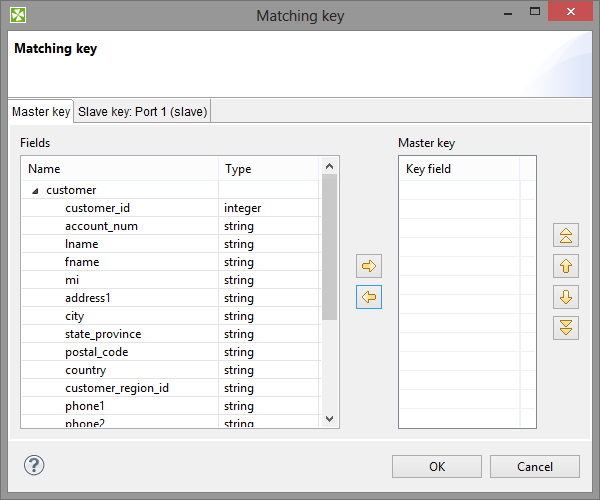 Matching key was defined as a master field name. Slave override matching key was its slave counterpart. Thus, in the case mentioned above ($masterField=$slaveField), Slave override matching key would be this slaveField only. And Matching key would be this masterField. For more information, see CTL Scripting Specifics or Java Interfaces. ApproximativeJoin is a fuzzy joiner that is usually used in special situations. It requires the input to be sorted and is very fast as it processes data in the memory. However, it should be avoided in the case of large inputs as its memory requirements may be proportional to the size of the input. The data attached to the first input port is called master as in the other Joiners. The second input port is called slave. Unlike other joiners, this component uses two keys for joining. First of all, the records are matched in a standard way using Matching Key. Each pair of these matched records is then reviewed again and the conformity (similarity) of these two records is computed using Join key and a user-defined algorithm. The conformity level is then compared to Conformity limit and each record is sent either to the first (greater conformity) or to the second output port (lesser conformity). The rest of the records is sent to the third and fourth output port. 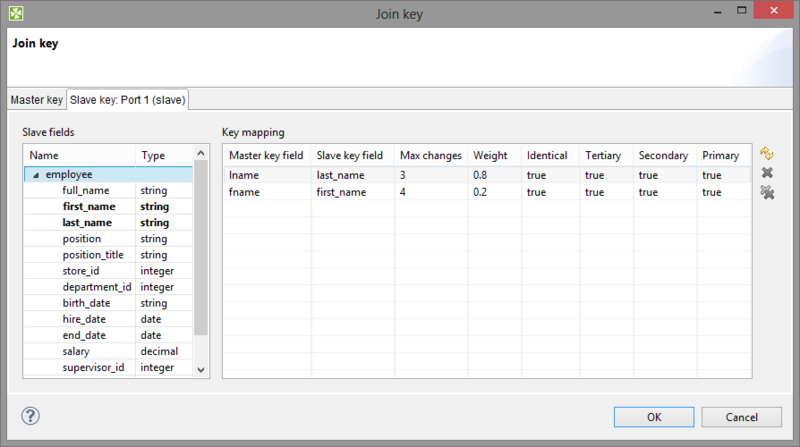 You can define Join key with help of the Join key wizard. In the wizard, there are two tabs: Master key and Slave key. In the Slave key tab, you can see the Fields pane (containing all slave fields) on the left and the Key mapping pane on the right. You must select some of these slave fields and drag and drop them to the Slave key field column at the right from the Master key field column (containing the master fields selected in the Master key tab in the first step). In addition to these two columns, there are other six columns that should be defined: Maximum changes, Weight and the last four representing strength of comparison. The maximum changes property contains the integer number that is equal to the number of letters that should be changed so as to convert one data value to another value. The maximum changes property serves to compute the conformity. The conformity between two strings is 0, if more letters must be changed so as to convert one string to the other. The weight property defines the weight of the field in computing the similarity. Weight of each field difference is computed as a quotient of the weight defined by the user and the sum of the weights defined by the user. The strength of comparison can be identical, tertiary, secondary or primary. Only identical letters are considered equal. Upper and lower case letters are considered equal. Diacritic letters and their Latin equivalents are considered equal. Letters with additional features such as a peduncle, pink, ring and their Latin equivalents are considered equal. In the wizard, you can change any boolean value of these columns by clicking. This switches true to false and vice versa. You can also change any numeric value by clicking and typing the desired value. $first_name=$fname(3 0.8 true false false false);$last_name=$lname(4 0.2 true false false false). In this Join key, first_name and last_name are fields from the first (master) data flow and fname and lname are fields from the second (slave) data flow. 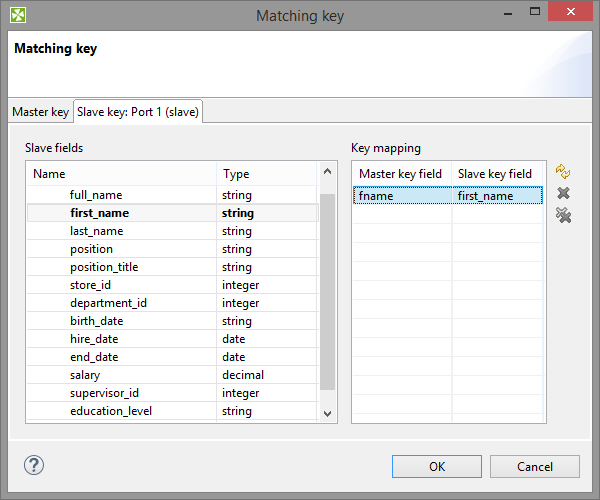 In the Slave key tab, you must select one of the slave fields in the Fields pane on the left and drag and drop it to the Slave key field column at the right from the Master key field column (containing the master field the Master key tab) in the Key mapping pane. You have to define the limit of conformity (Conformity limit (0,1)). The defined value distributes incoming records according to their conformity. The conformity can be greater or lesser than the specified limit. You have to define transformations for either group. The records with lesser conformity are marked "suspicious" and sent to port 1, while records with higher conformity go to port 0 ("good match"). Identical - is a character-by-character comparison. The penalty is given for each different character (similar to String.equals()). Tertiary - ignores differences in lower/upper case (similar to String.equalsIgnoreCase()), if it is the only comparison strength activated. If activated together with Identical, then a difference in diacritic (e.g. 'c' vs. ' ') is a full penalty and a difference in case (e.g. 'a' vs. 'A') is half a penalty. Secondary - a plain letter and its diacritic derivatives for the same language are considered equal. The language used during comparison is taken from the metadata on the field. When no metadata is set on the field, it is treated as en and should work identically to Primary (i.e. derivatives are treated as equal). Primary - all diacritic-derivatives are considered equal regardless of language settings. As the final step, the total conformity is calculated as a weighted average of field conformities. When you define your join attributes, you must specify a transformation that maps fields from input data sources to the output. This can be done using the Transformations tab of the Transform Editor. However, you may find that you are unable to specify more advanced transformations using this easiest approach. This is when you need to use CTL scripting. CTL scripting allows you to specify a custom field mapping using the simple CTL scripting language. If you specify the transformation in an external file (with Transform URL), we recommend you to explicitly specify Transform source charset.